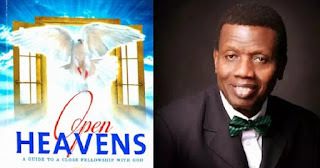 Open Heaven [10 May 2018] The Greatest Ally In Battle - Open Heavens Daily Devotional Messages, By Pastor E.A Adeboye. Jehovah-Nissi is a name of the Lord that has its roots in Exodus 17:15. After Joshua and the Israelites had defeated the Amalekites at Rephidim, Moses erected an altar to commemorate this victory and He called it “Jehovah-Nissi”, which means “Yahweh is my banner”. In other words, he was saying “the Lord is my banner of victory.” This name is a call to God’s people to rally around God as an army gathers around its banner, because God is the One who leads us to victory. God has zero tolerance for the enemy’s harassments and threats against His children, whom He brought with the precious Blood of His Son, Jesus. With this understanding, you will realise that our God is the greatest ally you can have in the battle of life. The Almighty God is Jehovah-Nissi, the Lord our Banner, and He is the Lord of hosts. Therefore, the battle is not yours but His. Always be conscious of the reality of the Lord as Jehovah-Nissi in your life. Father, You are my Jehovah-Nissi, please repond to every roaring threat of the enemy against me in Jesus’ Name.